The advent of the writers strike gave me some apprehension about its potential affect on my television viewing habits, but I was mainly indifferent about the quarrel between entertainment companies and the Writers Guild of America over the vagaries of demands for compensation for streaming media. 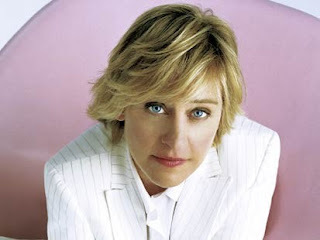 My feeling changed when I read the negative comments that the union had made about Ellen DegGeneres' decision to honor her contractural obligations to produce and host her show. It was really vicious, unfair stuff about her personally. From those comments and other things I have read from writers, I am disgusted with them and I hope they gain nothing. I know I will reflect about this and realize that the hotheads in the union that are spewing their vitriol over the internet don't represent everyone and I shouldn't hold all of them accountable for the actions of a few, but for now I am seeing the ones who aren't putting their pencils down when it comes to demagoguery as being horrible, despicable people. If the writers have a beef with the production companies they shouldn't drag other people into it. They have the right to stop working, but to insist that Ellen put her 135 staff members out of work during the holidays is unconscionable. If the writers demand were to give everyone a 5% across the board increase it would be different, but their demands are only for their own benefit. The writers aren't striking over working conditions, healthcare, pensions, job security, cost of living adjustments, or even base pay. They want to keep getting paid on work they have already been paid for. It is the anachronistic concept of residuals. Instead of being paid upfront for a complete assignment of copyright, they, along with actors and others, keep getting paid every time the material is used to generate income. How many other lines of work get this scheme? Do the road workers building toll roads get a future cut of every toll that is paid? Do teachers get a percentage of all of their students' future incomes? How about parents? If it weren't for their work, you wouldn't exist at all. Do you give them a cut of all your potential wages? From my perspective, the media companies want to make more money and the writers want to make more money, but neither seem necessarily better than the other. As Orwell wrote, "The creatures outside looked from pig to man, and from man to pig, and from pig to man again; but already it was impossible to say which was which."